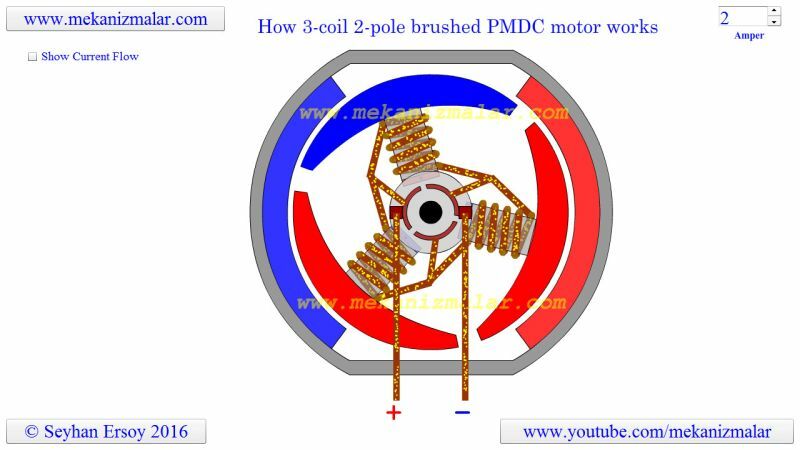 How three-coil two-pole brushed pmdc motor works? Electric motors are based on the principle that opposite polarity magnets are attracted to each other, while magnets of the same polarity repel each other. One magnet is located on the stator and one magnet is on the rotor. If those magnets are not lined up, the rotor will turn until they are lined up. Once the magnets are lined up, the rotation stops. To sustain rotation, and because the permanent magnet cannot be reoriented, the electromagnets must be activated or deactivated. In a typical DC motor, the stator is the fixed, permanent, magnet and the rotor is composed of a number of windings. One or two windings are activated at a time via communication, depending on the number of coils on the rotor. Notice that in this animation commutator has three gaps. The first electric motor developed based on electromagnetism was the two coil and two poles brushed dc motor. Since I could not find a naming convention for the brushed permanent magnet dc motors, I am calling this motor the three coil two poles permanent magnet DC motor. This is because the rotor contains three coils and stator contains two poles. I chose to the animation of this motor first because it is more intriguing than the two coil two pole motor. It was initially had for me to grasp the current flow inside the motor. I wanted to see it, and that's why I took this challenge. I am sure for many this is an easy task, but for me who has a dusted knowledge on this subject it was quite difficult. I am sure it is hard for anyone with experience or even a novice to understand the flow direction when the rotor is spinning fast. To reduce the motor speed, we have to reduce the current passing through it, doing so will slow our animation. However, current flow speeds will also go down. When we stop the motor to see the complete current flow, there will be no flow. To remedy this, I added the Show the current flow check box to the animation. It creates a condition that someone breaking the shaft while the current is flowing in the rotor. This enables us to see the current flow when the rotor is standing still. Before going into the details of the current flow, let me mention something crucial in this motor. In any given instant, there are two poles with the same polarity in the rotor. IF we have two north and one south polarity, it will be followed by two south and one north polarity. Since we have two coils with the same polarity and one with opposing single polarity, there will be two current flow passing through these poles. The long path of the current will pass from two coils with the same polarity and a short current will pass from the single opposing polarity. Please also note that there is always one wire connected to commutator with no current flow. Let me show you these current flows with 2 north and one south polarity coils, and later with 2 south and one north polarity. I will first show you long, then short current flows followed by no current flow line. Please follow mouse pointer when I am showing the flow paths. I find this animation very beneficial for my understanding of the subject matter, I hope that it will make you understand the motor winding as well.